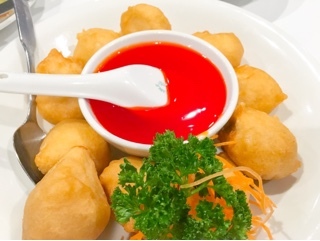 Choice of the Orient (“COTO”) is a chop suey restaurant, serving a “bit of everything” with dishes that have been adapted towards a Western palette. Personally, I feel the “Western” palette has now transformed to enjoy and desire more traditional fare. Yet, old school chop suey restaurants, which have been in business for decades still have a loyal following. One person would be my husband who insists we visit COTO annually to sample the Chinese food of his childhood. In all honesty, I would never go to the restaurant in my own free will; there are so many delicious authentic offerings that paying relatively high prices for okay food isn’t appealing. 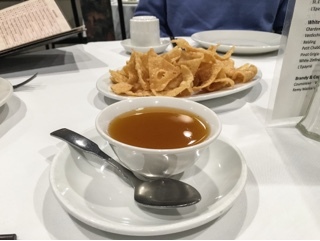 However, the restaurant has grown on me throughout the years and I actually started looking forward to one dish – their hot and sour soup ($3.50). Only available by individual bowls, the soup arrives nice and hot with a generous sprinkle of fresh green onions. It has a nice balance between spicy chilies and tart red vinegar, working together to form a flavourful broth. 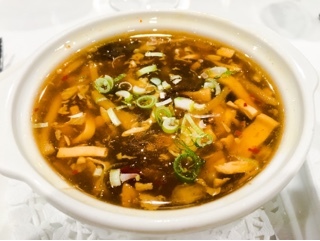 COTO doesn’t skimp on ingredients – there is tons of black fungus, tofu, egg and bamboo shoots within it. 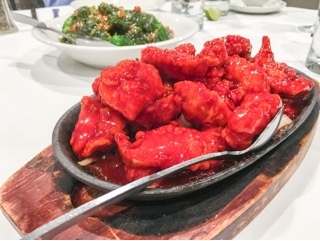 The Peking chicken ($12.95) is also pretty good: large chunks of tender white chicken meat, deep fried and smothered in a sweet “ging do” sauce that’s lightly caramelized on the sizzling plate. Even the sweet and sour chicken balls ($10.95) weren’t as repulsive as I expected. Although the breading looks thick, it’s rather fluffy on the inside and has a crunchy exterior. If only COTO marinates the chicken to give the actual meat more flavour, the dish would be even better. Although not spicy at all, the stir fried broccoli with hot spicy sauce ($9.95) retains its crispiness and the thick savoury vegetable sauce on top is a nice addition to their rice dishes. 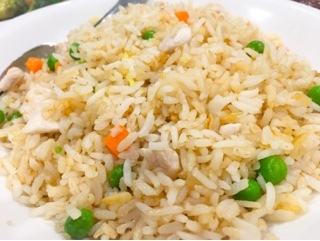 Certainly, the chicken fried rice ($8.95) needs the extra boost of flavour as by itself is rather tasteless and bland. 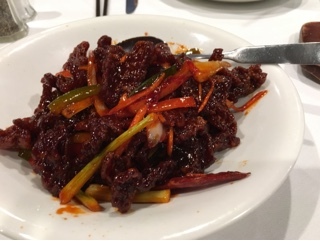 The julienned crispy beef ($13.95) was the sole disappointing dish that’s part of their specials board (although I’ve seen every year so it’s likely a permanent stay). Sliced way too thinly, after the beef has been deep fried, it loses all chewiness and ends up tasting like beef rind glazed in an overly sweet sauce. What impresses me most about COTO is their ability to carve a niche for themselves and continue to serve this dedicated market for so many years. Certainly, most of the Chinese restaurants of my childhood have long shuttered and closed. So, to have a place that tastes like the days of your youth, there’s something endearing about that.